While on the Internet, users often have to type logins and passwords, however, the one reason they may be reluctant to do it is they are concerned with their password protection thinking if they type their password within a browser window, the password may become compromised. To a certain extent, this is true. If you prefer to save your passwords within a browser, your password may become exposed to other users who work on the same machine. The best way to solve this problem is to use professional password protection software such as Handy Password manager. With Handy Password your passwords and logins are never exposed to any third party as Handy Password stores your logins and passwords in a secure database protected with a master password. The database with your passwords can be stored locally, or in your mailbox from which you can download it to any local computer so you can enter your passwords automatically and securely from anywhere in the world. In addition, if you ever forget your password or change the preferred browser you still get to use your database together with the password protection software. Besides that, using professional password protection software such as Handy Password manager makes sure no one can peep over your shoulder to watch you type your passwords because with Handy Password manager, you don't really have to type it. 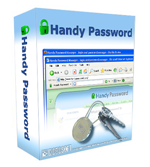 Protect your passwords with Handy Password manager! DOWNLOAD Password manager.